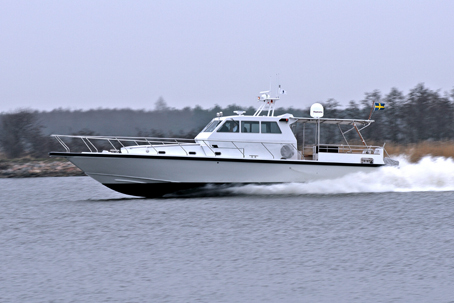 The IC 16.5 M VIP design is based on the successful IC 16 M Patrol Boat. We have recently produced two new luxury “Sports Utility Craft – SUC” to Abu Dhabi owners. The two SUC 16.5 M (or 16.5 M VIP) crafts are fitted-out to the highest Luxury Yacht standards both on deck and below creating a unique combination of a fully professional technical platform with a most sophisticated accommodation; a Sports Utility Craft. IC 16.5 M is in all aluminum construction and powered by two diesel engines giving a combined output of up to 2000 kW (2720 hp) and a sprint speed of 55 knots.